Former Vice President Joe Biden's famous love of ice cream is about to be recognized with a new flavor named for him. The Cornell Daily Sun reports that the university's on-site dairy brand, Cornell Dairy, will be teaming up with the Cornell Convocation Committee for the Biden-inspired flavor. Biden, who has been photographed numerous times during the Obama administration stopping for a frozen treat while greeting supporters across the country, will be speaking at Cornell's convocation on May 27th. 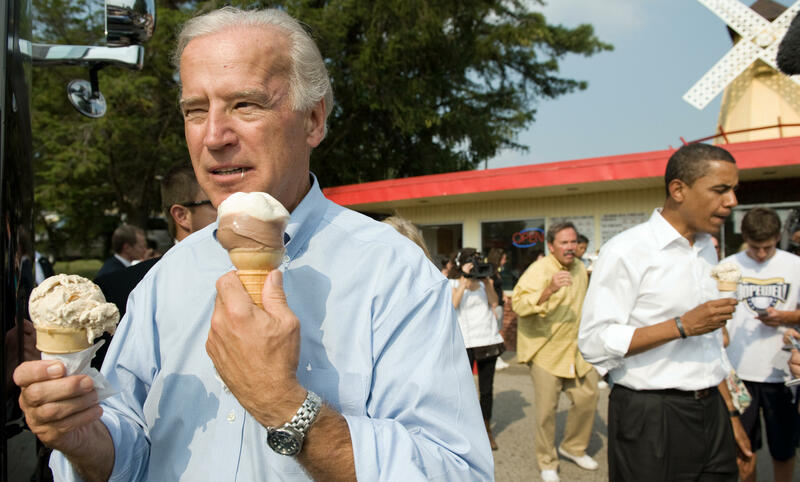 In the past, he has even introduced himself with the words, "My name Joe Biden, and I love ice cream." That's how he opened a speech on the economy and federal overtime -- delivered at a Columbus, Ohio ice cream shop back in 2016. "You all think I'm kidding, I'm not, I eat more ice cream than three other people you'd like to be with, all at once," he added. Cornell Dairy partners with the Cornell Dairy Processing Plant to provide dairy food education, research and extension programs for Cornell students, as well as supply dairy products to the campus. Students will vote on a final name for Biden's flavor on Monday -- the names in contention are "Biden's Chocolate Bites; Bits n' Biden; Big Red, White & Biden; Not Your Average Joe's Chocolate Chip; and Uncle Joe's Chocolate Chip. The final flavor name will then be formally approved by Biden's representatives.